"This is an opportunity to get outdoors with friends and family and connect with nature," said Mike Kurre, Minnesota Department of Natural Resources (DNR) mentoring program coordinator. "And there are a number of opportunities for people to learn how." Clinics are being offered Saturday, Feb. 19, at Lake Carlos near Alexandria and Bear Head Lake near Ely. 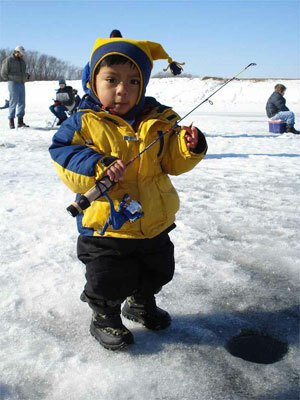 Lake Bemidji State Park offers a Berrrmidji Kids' Ice Fishing event on Sunday, Feb. 20. Kids ages 8-15 can join the Lake Bemidji State Park naturalist for an afternoon of perch fishing on Lake Bemidji. Participants must register for events by contacting the appropriate state park. A daily or annual vehicle permit is required to enter state parks. Unlike summertime shore fishing, ice fishing presents some unique challenges. The DNR's MinnAqua program, which is designed to teach angling recreation and stewardship as well as the ecology and conservation of aquatic habitats, offers ice fishing tips. Dressing in layers is the best way to deal with winter's icy chill. Layers keep people warm by creating pockets of warm air and helping moisture evaporate. Plopping an ice shelter down in the middle of ice shack city doesn't guarantee success because noise and traffic often spook fish, so find a private hole. If that's not an option, keep to the outside ring of these "cities on ice." Try different jigging styles. If a slow, methodical jigging motion isn't working, try an aggressive one, or try a lift-and-drop technique. The MinnAqua program also works with the "Ice Team," a group of manufactures who help educate anglers by providing expert volunteers, hands-on activities, and equipment for schools, events and mentoring organizations. They also provide ice fishing tips, helpful links, basic ice safety information and fun stuff for kids to keep them busy on the ice. "There's no better time to introduce somebody to the world of ice fishing than the long holiday weekend," Kurre said. "Help a youngster enjoy the beauty of a Minnesota winter and make a lasting memory." Kurre and Mike "Smitty" Smith from the "Ice Team" share insights and information about kids, mentoring and ice fishing in an online podcast audio program available on the DNR website.